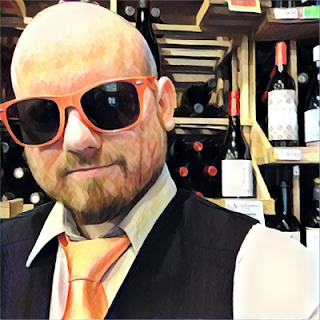 I've done a few beer reviews now for this wine blog and it's always fun. I love beer. In fact, lately I've been consuming more beer than wine, as I've been spitting wine to write my reviews and taste at the spring grand tastings. But beer to me is a delicious refreshment that I can occasionally geek out about if it's good enough. Wine, on the other hand, is an all encompassing obsession. This beer caught my eye with its name, clearly referring to wine. 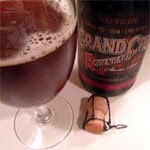 Rodenbach is located in Roeselare, Belgium and was founded in 1821 by four brothers. Eugene Rodenbach, the grandson of one of those brothers, took over in 1878 and traveled to England to learn how to age beer in oak barrels and blend young and old beers together to create a balanced and wonderful beer. Rodenbach was sold to Palm Brewery in 1998 but the tradition of the founding family continues. 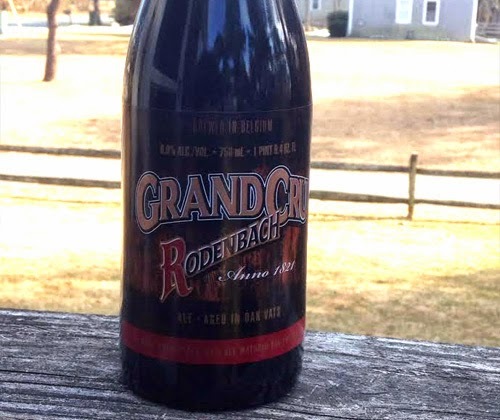 Grand Cru is a Red Ale with 33% young beer and 67% old beer that was aged for two years in oak barrels. The name Grand Cru refers to the oak aging like some of the finest wines in France, and claiming its "finish is worthy of a great wine". It's highly rated and praised across the interwebs. It comes in a 750 ml bottle for $10 and has an ABV of 6%. So instead I pour it into my stemmed beer glass, pretending to be a civilized gentleman for a minute. The color is a hazy copper with a thin head and little black floaties swimming around. The oak is pretty prominent on the nose, combining with cherry to immediately make me think of the cherry wood I buy for grilling. I can actually understand why they decided to call it Grand Cru, because just the smell alone is very Pinot Noirish. It even has that PN dankiness to it, and there's a champagne/sherry yeast aroma as well. The palate is more comparable to a Blanc de Noirs sparkling wine than anything. It's all about the sour cherries and acidity while maintaining a smooth body. It's pretty straight forward about that and I don't see a problem there because it's simply yummy. It finishes with sour cherries, red apple and oak. Normally I'm not a fan of sour beers but this one is outstanding! And even though the name is admittedly gimmicky, I do believe that any wine lover would agree that it is indeed outstanding! This won't be the last time I buy this beer. It'll be revisited multiple times, and become a good fall-back staple for the price.